All I have wanted to do lately is just sit and watch TV. I don’t know what has me so low-energy, but dang. So in getting ready for my weekly blog post, I was looking through my pictures, and I realized that I haven’t made anything recently to blog about! I guess you have to do the projects before you can write about said projects. I’ve even had some celebrations to bring desserts to lately, and instead of making desserts, I’ve bought them — gasp! So today I kept scrolling through my old pictures and found some snapshots of a coconut cake from two summers ago that I forgot to post. The pictures aren’t all that great quality, but it is a delicious cake, so why not? This one is not hard, but is a little time-consuming, as filled layer cakes tend to be. It’s worth it though. I made this one for a friend’s birthday, which we enjoyed at the pool on a beautiful North Carolina June day. 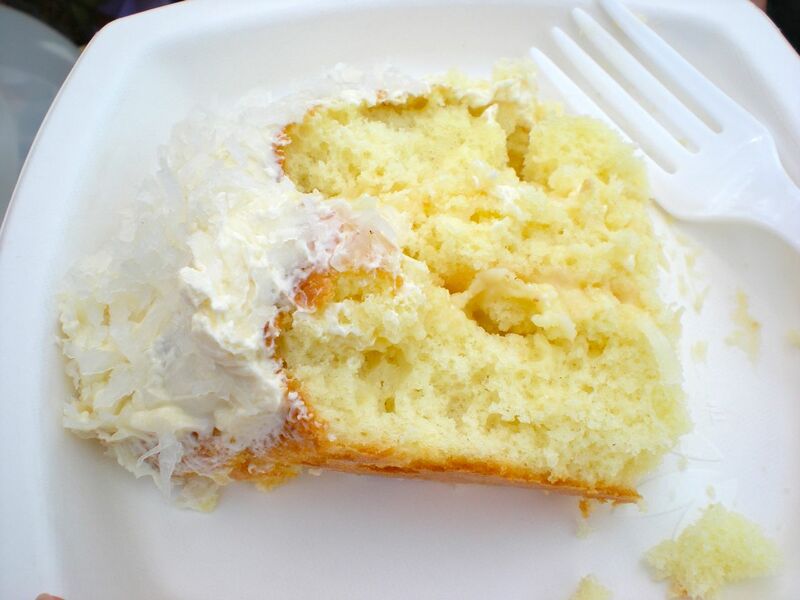 Thinking about it while I sit looking at a gorgeous North Carolina May day makes me really want some coconut cake. Maybe this will finally give me some energy to get off the couch. We’ll see. Preheat oven to 350 degrees. Grease and flour two 9″ round pans. Separate the eggs, reserving both the yolks and the whites. In a large bowl, mix together 2 cups sugar and 3/4 cup butter. Add 3 egg yolks and beat well. In a separate bowl, whisk together flour, baking powder, salt, and coconut flakes. Stir the dry ingredients alternately with the coconut milk into the sugar mixture. Beat well. Stir in vanilla. Whip egg whites until stiff, and fold in whipped egg whites. Pour batter into prepared pans. Bake at 350 for about 30 minutes, or until a toothpick inserted near the center comes out clean. Combine sugar, cornstarch, and salt in a saucepan and cook over medium heat. Gradually whisk in milk. Cook, stirring constantly, over medium heat until mixture thickens and comes to a boil, about 10 to 12 minutes. Remove from heat. Whisk 1/2 cup hot milk mixture into the reserved egg yolks to temper. Slowly pour warm yolks into the saucepan, stirring constantly. Cook slowly, stirring, over medium-low heat, until mixtures begins to bubble, 5 to 6 minutes. Remove from heat. Stir in coconut and vanilla. Transfer filling to a medium mixing bowl. Lightly butter a piece of plastic wrap, and lay it directly on top of filling to prevent a skin from forming. Chill until firm, at least 1 hour. 1 cup (2 sticks) unsalted butter, softened but not melted! Beat butter for a few minutes with a mixer on medium speed. Add 3 cups of powdered sugar and mix on low until incorporated. Add vanilla, salt, and 2 tablespoons milk/cream. Beat on medium for 3 minutes. If you prefer a thicker or more stiff frosting, add sugar until desired consistency. If you desire a thinner frosting, add remaining milk a little at a time until desired consistency. Slice the dome off the top of one of the cake layers to achieve a flat top. Spread with a liberal amount of cream filling. Place the second cake layer on top. Cover the entire cake, top and sides, with frosting. 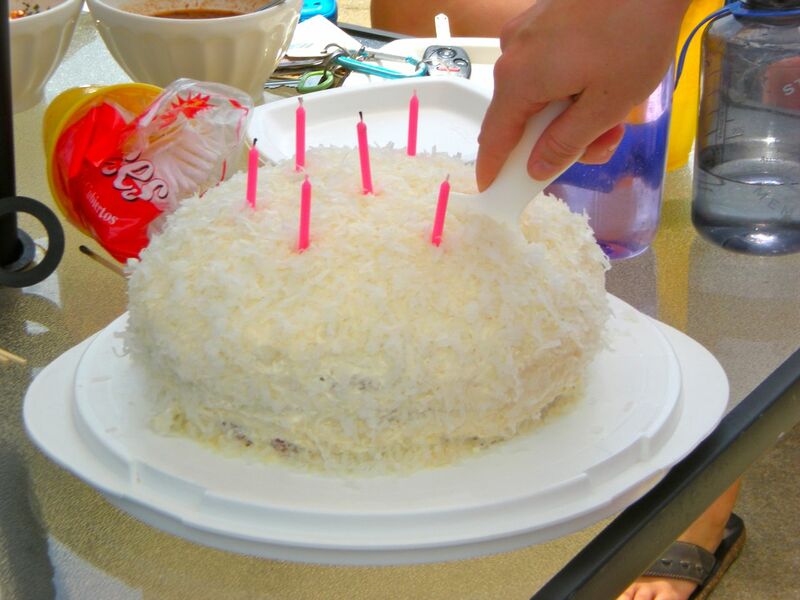 Press coconut flakes into frosted cake. If desired, you could slice each cake layer in half in order to have 4 layers with filling in between each.